Be ready to overcome various financial challenges. Share and exchange views on your investments. 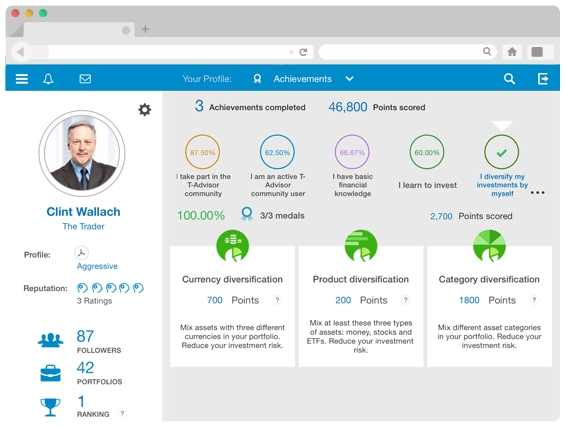 Share your portfolio’s performance and exchange investment ideas with other T‐Advisor members. T-Advisor has evolved to allow the exchanging of ideas between investors: the T-Advisor community. Every user has a different profile screen that enables you to share relevant information relating to their portfolios or to publish comments on their own wall. They can also follow or be followed, and receive messages from other members of the community. T-Advisor develops your understanding of finance through the completion of 8 tasks. By earning medals and points, you can improve your position. Improve your ranking through competition with others and by getting a better score and return on your portfolio.